The habit of prioritizing breakfast has continued into adulthood, and having a leisurely breakfast is one of my favorite things. I believe some of the keys to adding health to our breakfast and making it something we must do, are: Prioritizing our health, proper planning of our time, learning to mix things we love with things we may not love as much, and having fun with it. For the past three mornings I’ve had some time to “play with my food” and I’ve discovered the absolutely best way to have my Eggo waffles. Now, what you eat is important but how you eat it can make a huge difference. So I love taking my waffle, folding it in half then stuffing it with my eggs, fruits and veggies and sprinkling chopped cilantro on top. Absolutely no syrup! Yes, yes, I know you have your favorite ways to eat waffles as well, but there’s nothing like delighting your taste buds, yet also making sure your body gets the healthy stuff it needs. 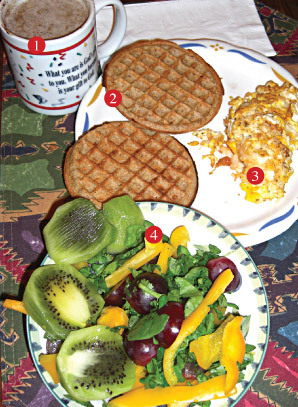 For 2011, challenge yourself to a healthier lifestyle and start with breakfast. In the kitchen hangs a small plaque with a poem entitled “The Spice of Life,” it was placed there by Laura’s husband. The poem talks about all the things that civilized man can live without, but states emphatically that civilized man can’t live without cooks. Some 17 years after his passing, the plaque still hangs. That’s really interesting because there is no longer a REAL cook in that house on Calmer Circle — Laura’s husband, was a chef. To me, real cooks are those people who can “throw down” at anytime, under any circumstances. There is a certain atmosphere I have to create before I can cook. So after getting out of bed I spent some time praying, giving thanks, then reminded the Lord that I needed his help in the kitchen so things can turn out “right”. Next, I fixed my hair and headed for the shower. I’m not one of those cooks who can head to the kitchen, hair uncombed, looking frumpy, I’m not that good a cook. I have to draw on everything to create the atmosphere for good cooking. I got dressed in white shorts, a pink top and my 3-inch-heel house shoes, powdered myself with something lavender, (the aroma of calm) then headed to the kitchen. At times like these I’m glad Laura is not a cook. As a matter of fact, without prompting she will gladly offer two pieces of information about herself, “I’m 87 years and I don’t cook,” delivered with the pride of an 80-something who has lived long enough not to care. But that works for me, I’ve discovered that real cooks have little tolerance for people like me, especially good christian cooks. I say this because I made that discovery while trying to help out in kitchens at different churches. Only last month I was asked to help in the kitchen during “Trunk a Treat” at the church I attend. After helping with the hot dogs I offered to help the person who was washing the pots, rinse, she had turned, looked at me and said “We do REAL WORK in this kitchen.” I had smiled at this good christian woman, then taken my high-heel-wearing, no-real-working-self up to the kids’ area to have some fun. I can’t say I blame them though, real cooks I mean, for I have three things that work against me in the kitchen. I move about the kitchen with a relaxed, unhurriedness that frustrates real cooks — they like to rush, bang things, make noise. Sometimes when I’m “creating” in the kitchen I have no clue what the end result will be — real cooks always know what they are making. Finally, I never follow recipes. I went about making my part of our thanksgiving dinner, stuffed eggplants, rice and beans and a spinach salad, my other family members were preparing the other foods on the menu. While preparing the salad I realized I had forgotten to buy grape tomatoes. I scanned the fridge and saw red grapes, practically the same thing I thought, they are roundish, reddish, delicious and good for you, so I used those instead. Now, a word to my dear husband. When we finally meet and realize we love each other enough to commit, please note that on occasions like these if I forget to buy something I will not be rushing out anywhere to get it, neither will I be asking you to go and pick up this or that at the last minute, we will use what we have. On the flip side, if you take pleasure in having as many balls in the air as possible, if you thrive on chaos because it makes you feel like you have life going on, sweetie, please try to practice now how to put away some of your balls, learn to know and love yourself in stillness — I will not have chaos invade my calm. The good news is that everything was delicious. My brother as usual boasted about his turkey and offered a challenge for next year. 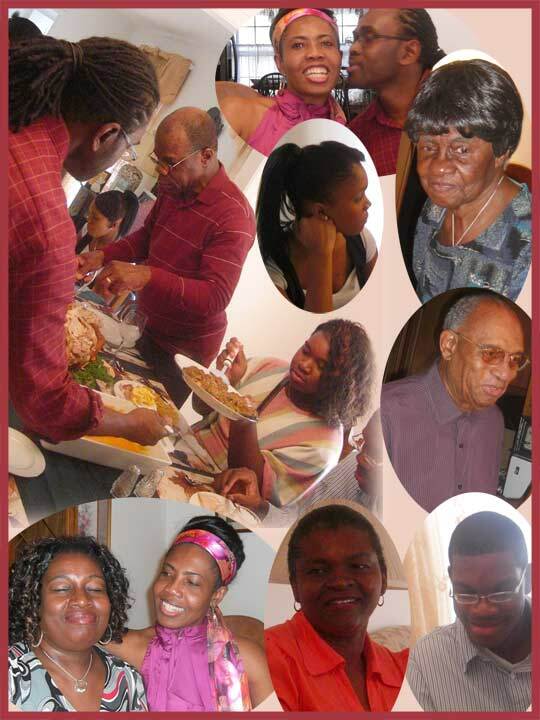 As we sat at the table eating, talking, laughing, enjoying each other, I felt rich. I thanked God for these people He had placed in my life, those who were family by blood and those who have become my family. Once again I was awakened to the realization that this is what life is about, this is the “REAL SPICE OF LIFE” – people to love, the knowledge that they love you back, and the good sense to appreciate it all. 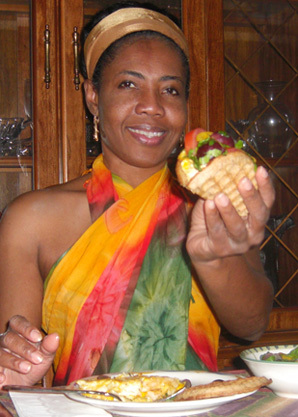 This is Dona Halliday challenging you to recognize “the real spice of life,” those people who have been placed in your space to add flavor to your existence, give thanks and show appreciation.